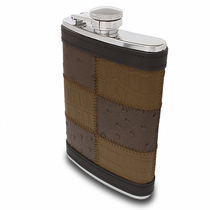 Looking for a unique style of flask? Whether it’s for yourself to for a gift to someone special, these leather and stainless steel flasks have the “wow” factor you’re looking for. 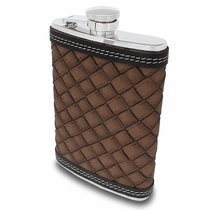 These leather flasks offer a unique touch that makes them feel more personal than the plain flasks you’ll typically find for sale online. Whether it’s a uniquely embellished leather covering or a particular color of leather that you love, you’ll be able to find a flask that suits either you or the recipient perfectly when you shop at Titanium Jewelry. Our leather and stainless steel flasks are ideal for a wide variety of gift-giving occasions. From graduations to anniversaries and retirements, there are certain milestones in life where a flask makes for a truly memorable gift. These leather flasks are especially popular for groomsmen gifts. In fact, the grooms often like the gift so much that they end up buying one for themselves! 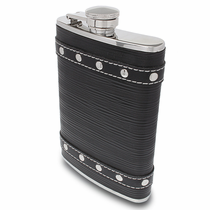 And when giving these flasks as a group gift, the variety of styles really comes in handy. Despite similar pricing, each flask in this collection from Titanium Jewelry has a distinctive look. So you can get a classic brown leather flask for someone with more laid-back, country style while choosing a chic black studded flask for a loved one who tends to have a trendier urban look. Whatever the occasion or the style you’re looking for, you can find a perfect fit in this collection of stainless steel leather flasks from Titanium Jewelry. These modern, rugged and striking flasks are something that any guy would love to receive. Plus, they come with a 90-day money-back guarantee just in case you change your mind plus our lifetime warranty to ensure long-lasting durability.